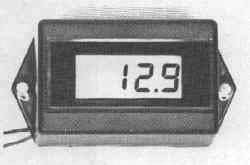 Measure volts in 11, to 65 volt systems with these high-quality, low-cost LCD digital meters. The surface mount, 3" x 2" x 1" plastic enclosure can be easily attached to wood or metal surfaces with two screws. Terminal strip on the back of the meter accepts 14 to 24 AWG wire. Use 22 AWG wire for up to 50 feet and 18 AWG for 150 feet of wire between the meter and the shunt.